One of my favourite breakfasts is none other than the dutch baby. It's a cross between a pancake and an eggy bread because of the high egg to flour ratio. It's super simple to make and I always have the ingredients on hand. I've made it with fresh and frozen blueberries, both with great results. Today's was made with "throw many in the garbage and pick out the moldy ones" blueberries. 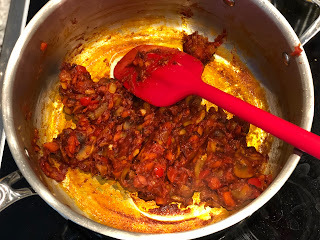 The recipe I have used again and again is from Always with Butter. I don't follow it exactly because I'm lazy and don't want to take the extra step in melting the butter, although I should try it one day and see if it makes a difference. Preheat oven to 425 with a 12" cast iron skillet inside. Whisk the eggs in a large bowl with the milk, vanilla and salt. Dump flour and cinnamon into the egg mixture. (You can mix the flour and cinnamon first beforehand if you like extra work =P). Whisk until well combined. Take hot skillet out and melt butter in the hot pan, ensuring butter covers the entire bottom. Pour mixture into the skillet & sprinkle with blueberries. Bake for 15 minutes, then turn heat to 325 & bake for an additional few minutes until golden brown. (I know a few minutes is vague. I can sometimes pull it out after the initial 15 minutes and other times I leave it in 3-5 minutes longer. The initial recipe calls for 10 minutes which I have never done before). Dust with powdered sugar and devour with maple syrup! 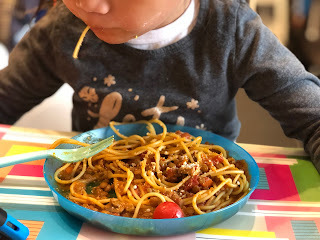 I miss the blogging world so I decided to try and randomly hop back on to share random ramblings every now and then. Posts will be short and sweet. 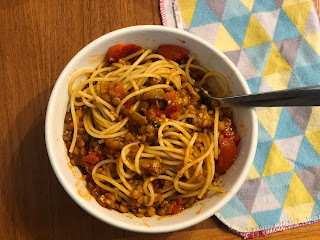 Tonight for dinner I tried a new recipe for lentil bolognese from The Endless Meal. It isn't the first time I've used lentils as a meat replacement and won't be my last. The final sauce was nice and hearty and although the flavours did remind me of a rich bolognese, the texture did not. Lentils have a starchy texture that just can't replace the texture of ground meat. 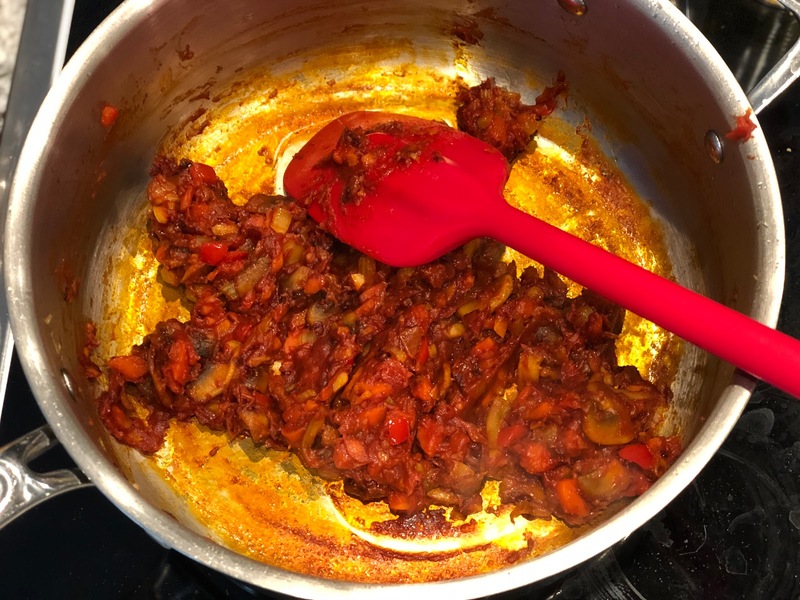 I added some mushrooms and only used half a red pepper. I would definitely make this again. 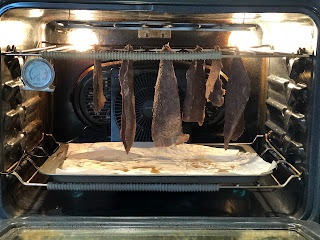 Onto the next topic, biltong jerky. 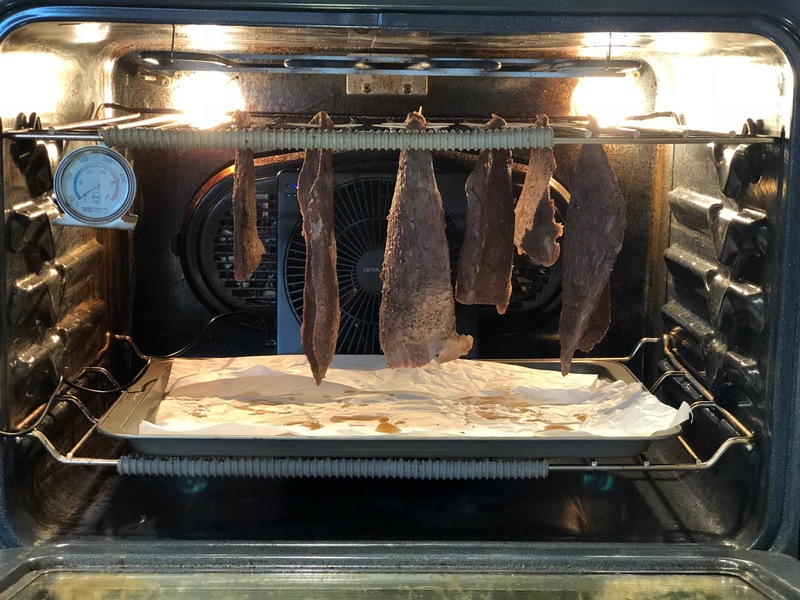 What the heck is biltong you ask? Apparently it's an African type of jerky. Jamie has tried making it a few times with little success but he picked up some from a local African market and it's really quite delicious. The key difference is it's not smoked but rather dipped or marinated in vinegar, coriander and other spices so it's got quite the sour tang to it. My house reeks and I remind Jamie every time I leave the house and come back in to a smack in the face vinegar smell, to which he replies, "What?! It smells awesome."